The RA-5C Vigilante, was designed by North American to be a nuclear strike aircraft. The bomb was held in a unique bomb bay that ran between the engines. The weapon was to be ejected aft of the speeding aircraft to give the crew time to escape the blast. The A-5 was capable of very high speeds so that the bomb could be dropped at relatively low altitude and still ensure crew survivability. As often happens, the aircraft was adopted to the recce platform which necessitated the addition of cameras and other sensors along the bottom of the aircraft in a canoe. In addition, fuel capacity was increased by using the now empty bomb bay between the engines for fuel as well as building up a fuselage hump for increased capacity. In this role was born the RA-5C. The aircraft was used extensively by the Navy in Vietnam. So successful was the aircraft, that the production line was reopened to manufacture additional aircraft as attrition replacements. As one would think, an aircraft of this sophistication was very maintenance intensive requiring over a hundred hours of maintenance time for each flight hour. The Viggie was retired in the mid 1970's and not replaced, the Navy deciding to use Marine RF-4Bs for reconnaissance instead. Way back when, there was a company called LS and they made some very neat kits in various scales. Eventually, they went out of business and were bought, along with Otaki, by Arii. Arii got a good deal as both companies had some very nice offerings. Arii did little more than change the logo on the box and reissued pretty much everything that these two companies had ever done. LS had an exceptionally good line of 1/144 aircraft, including a nice batch of P-3 Orions, which are infrequently reissued. 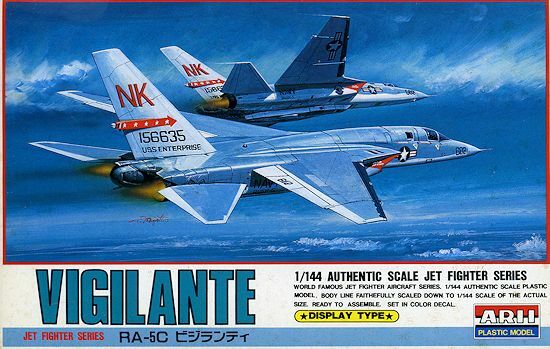 Among those neat 1/144 jet kits from both LS and Otaki was the RA-5C. 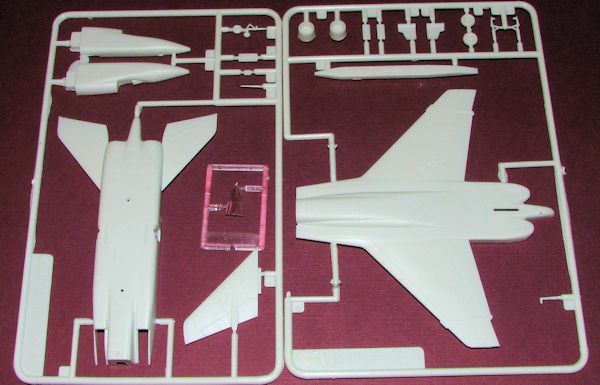 This kit is molded in white, is pretty accurate in outline and has recessed panel lines; pretty much everything a modern 1/144 military jet kit has. Where it is lacking is in a cockpit and a dearth of clear bits. For instance, t he camera windows in the canoe under the fuselage are sold and will need to be painted black as will the back seater's small windows. Landing gear are also simplified, though actually not all that bad as things go. Instructions are on a card that shows two exploded views of where bits are to be attached. No color information is supplied and everything is in Japanese. 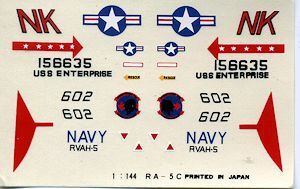 Markings are for a single aircraft from RVAH-5 aboard the USS Enterprise at the time. Fortunately, Starfighter Decals has or had a set or two of aftermarket sheets for this aircraft. If you want a nice 1/144 RA-5C then this is it. The kit is a mixture of first production and later production aircraft in that it has the curved lower intake sides of the early aircraft and the small strakes forward of the wing typical of the later production aircraft. Of course, sandpaper can cure this to make whichever variant fits your decals. In the case of the kit decals, the lower curved intake would need to be straightened.